Make sure you’re protected this summer with the best vegan sunscreen. Planning a trip somewhere hot like Athens? You’ll definitely need good sunscreen! 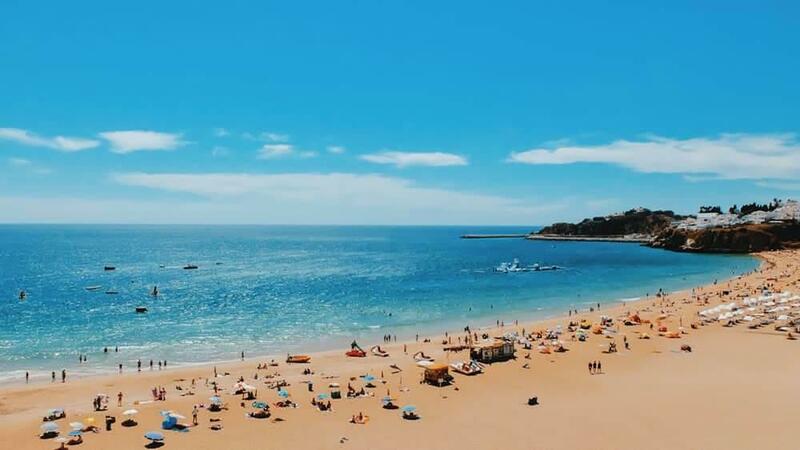 I didn’t realise how complicated sunscreen is until writing this article and researching sunscreens for an upcoming trip to the Canary Islands. Between chemical and mineral sunscreen, reef- and ocean-friendly options, deciding on an SPF, deciphering UVA and UVB and ensuring products are vegan, choosing sunscreen is complex. What’s the simplest solution? Wear sun protective clothing, a hat and seek shade. 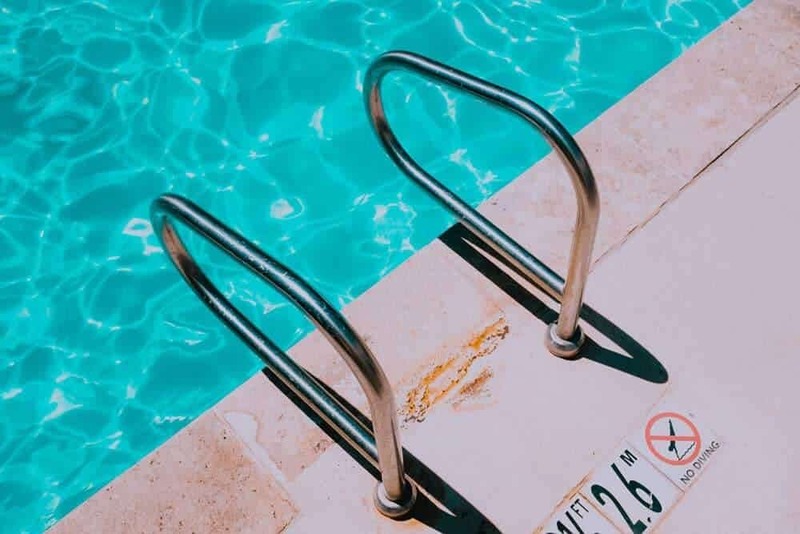 However, this isn’t always practical, so if you’re planning a holiday or to participate in a summer sport, here’s how to protect yourself, in a cruelty-free way. 1. What makes sunscreen vegan? 2. What’s eco friendly sunscreen? Like other body care products, sunscreen can contain animal products or be tested on animals. All natural sunscreen could be tested on animals (or contain non vegan ingredients), while cruelty free sunscreen isn’t tested on animals but could contain animal products like beeswax. Remember, just because a product says ‘natural organic sunscreen’ or ‘paraben free sunscreen’ doesn’t mean it’s free of animal ingredients. Vegan, cruelty free sunscreen is both free of animal ingredients and hasn’t been tested on animals. The products in this guide are all vegan — free of animal products and cruelty-free (not tested on animals). Another complicating factor is that some beauty brands may not engage in animal testing in the US or Europe (in fact, it’s illegal to test cosmetics on animals in the EU) but if they sell products in China, they’re obligated to test on animals in order to sell on the Chinese market. Because of this, most consider these products not to be vegan. Then, there’s the consideration of what parent company owns the brand in question. While the brand you’re looking at may not test on animals, many smaller brands are owned by larger parent companies, who may have a poor record on animal testing or other ethical considerations. Below, I’ve tried to find the best cruelty-free and vegan products (with an emphasis on smaller independent brands). Whether you’re planning spring break or packing for a road trip, make sure to pack your vegan sunscreen. Another aspect of sunscreen you may not have considered is whether it’s an environmental sunscreen. A sunscreen can be a vegan but not eco sunscreen, but since it impacts the earth many vegans are also concerned about ensuring they buy non toxic sunscreen that’s also vegan. This means it won’t harm the environment (particularly the sea) as it comes off your body into the natural world, which is impossible to avoid especially when swimming. If you’re going to be snorkeling, scuba diving or swimming in the ocean, look for a reef- and ocean-friendly sunscreen. Look for the best biodegradable sunscreen, meaning it will break down. And if you’ll be in the water, make sure your sunscreen is water resistant. UVA: The sun’s rays are divided into two types: UVA and UVB. Most of the rays you’re exposed to are UVA (and UVA can penetrate glass). Look for ‘broad spectrum sunscreens’ in the US, which mean they protect both UVA and UVB. In the UK, look for the star rating for UVA protection; the rating is between 0 and 5 with 5 being the highest. This actually shows the ratio of UVA to UVB protection. UVB: UVB rays are responsible for sunburn, and sunscreens were originally developed to protect from UVB. SPF ratings rate the UVB protection. SPF: SPF stands for sun protection factor and describes how much longer you can stay in the sun without getting a sunburn; for example, if you’d burn within 10 minutes of being in the sun, an SPF of 15 will allow you to stay in the sun 150 minutes (15 times longer). Chemical sunscreen: chemical sunscreen ‘absorbs’ the sun’s rays like a sponge, using one its active ingredients (one of the following: oxybenzone, avobenzone, octinoxate, homosalate, octisalate or octocrylene). There has been a lot of concerns over the damage some chemical sunscreens are causing to the ocean, in particular coral reefs, leading Hawaii and other places to ban it. Physical sunscreen: physical sunscreen, on the other hands, uses zinc oxide or titanium dioxide to ‘reflect’ the sun’s rays back, like a mirror. Those with sensitive skin often report physical sunscreen is less likely to cause a skin problem. Non nano sunscreen: these days, improvements in nanotechnology have allowed sunscreen manufacturers to make physical sunscreen with nanoparticles, which are much smaller and therefore don’t leave the ‘white cast’ of old-school zinc oxide (have you ever seen an old photo of someone with a streak of white on their nose?). Unfortunately, there’s concern that these nano particles are potentially damaging to marine life, and some think they may be bad for humans too (although there’s no evidence for the latter). The best non nano sunscreen is made with zinc oxide or titanium dioxide and is not harmful to ocean life. Vegan sun cream: vegan sunscreen is made without animal products, and not tested on animals. Cruelty free sunscreen: cruelty free sunblock isn’t tested on animals, but may contain animal ingredients, so check if it’s vegan. Healthy sunscreen: the term ‘healthy’ isn’t regulated, so it’s best to check ingredients and read reviews. Natural sunscreen: again, the term isn’t regulated, so ‘natural’ sunscreen brands can include whatever ingredients they want. Always check ingredients. Organic sunscreen: organic is a word that gets thrown around a lot, but I’m not sure what it would mean in terms of sunscreen as I don’t think you can have *organic* titanium dioxide. However, the other ingredients in sunscreen could be organically grown, which is better for biodiversity. The best organic sunscreen should still be environmentally friendly in other ways, e.g. ocean safe. Unscented sunscreen: Some people with sensitive skin find the scents used in most sunscreens cause flare ups. The best unscented sunscreen, therefore, won’t cause any breakouts or bumps. Paraben free sunscreen: parabens cause environmental concern as it’s believed they’re contributing to damage to coral reefs. Therefore, you should choose one without. The best paraben free sunscreen is also physical and therefore reef safe. Eco friendly sunblock: Eco friendly sunblock should be ocean and reef safe. Choose a physical sunscreen that’s parabens free. 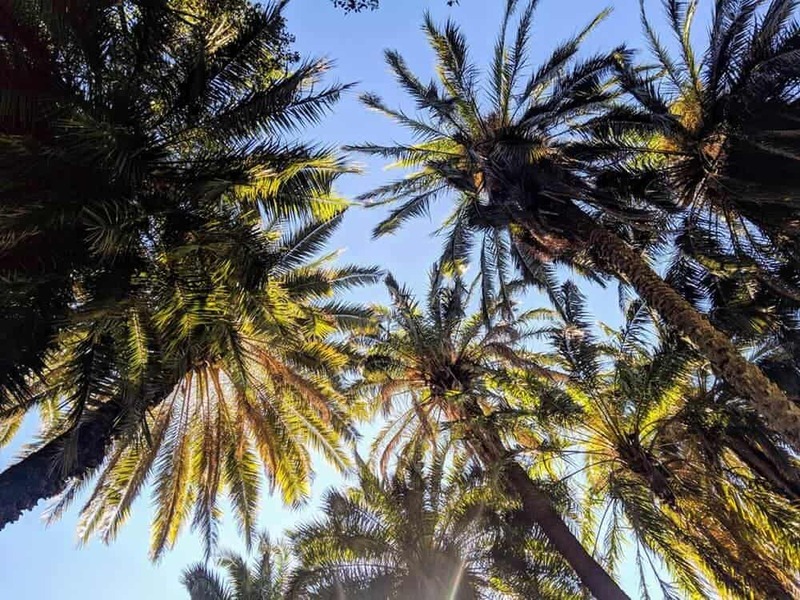 Biodegradable sunscreen: many aquatic nature parks and tours require biodegradable sunscreen, meaning suncreen that breaks down harmlessly in the environment, but it can be hard to determine if this is true. That’s why it’s important to look at the ingredients in the sunscreen. Reef safe sunereen: avoid sunscreens containing oxybenzone and octinoxate (which were recently banned in Hawaii and believed to cause coral bleaching), high concentrations of titanium dioxide, and sunscreens containing parabens or petrolatum/mineral oil. Vegan moisturizer with SPF: what about moisturizer? Well, even the best cruelty free moisturiser with SPF doesn’t necessarily work as well as sunscreen, depending on how it’s applied. 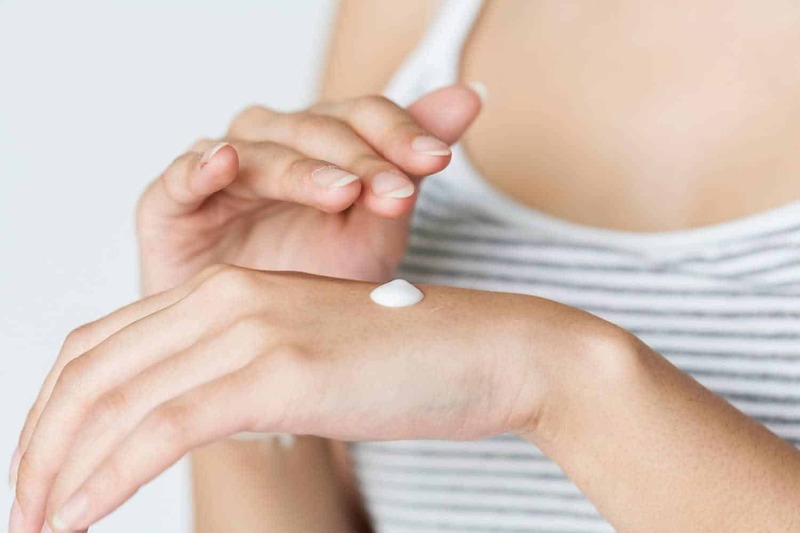 Very few people apply moisturiser in the quantity needed to protect skin (although the same can be said of sunscreen–apparently you need more than you think! ), and tend not to reapply frequently throughout the day like you should with sunscreen. However, if you do select the best vegan moisturizer with SPF for your needs, you can use it, just be sure you apply plenty and reapply frequently. Now that you know all about what to look for in a sunscreen, here’s how to find the best vegan sunscreen for you. Make sure you’re protected with a vegan SPF this summer with these sunscreens, wherever you’re looking for vegan sunscreen. Australia, the US and UK residents–clicking on any of the links below will take you to your local Amazon page. Vegan sunscreen Canada seekers, the same applies to you. One thing that disappointed me about vegan sunscreen brands in my research is that while most of them avoid the biggest offenders in terms of ingredients that have been shown to damage coral reefs, many of them still contain other ingredients that the Environmental Working Group warns may damage reefs. And many brands that are extremely reef safe and zero waste aren’t vegan (often because they’ve added beeswax). Hopefully this will change. I later read it’s an industry wide problem, with ingredients that are banned in marine reserves being used in over 90% of sunscreens (you’ll find a list of such ingredients here). You’ll need to decide which is the best cruelty free vegan sunscreen for you and your needs and budget, balancing everything. 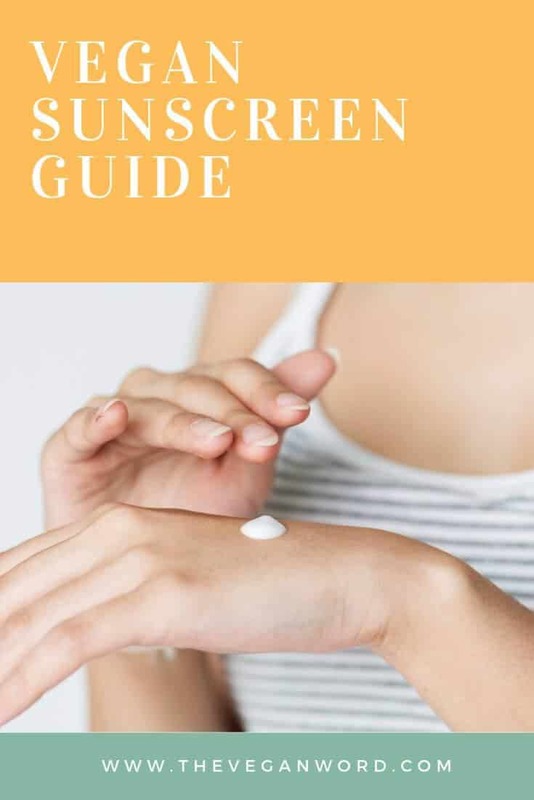 In my organic sunscreen reviews below, I’ve tried to outline the pros and cons of each cruelty free sun cream so you can decide which organic vegan sunscreen is for you. Each has pluses and minuses; unfortunately I didn’t find one perfect vegan sunscreen for face or body just yet. 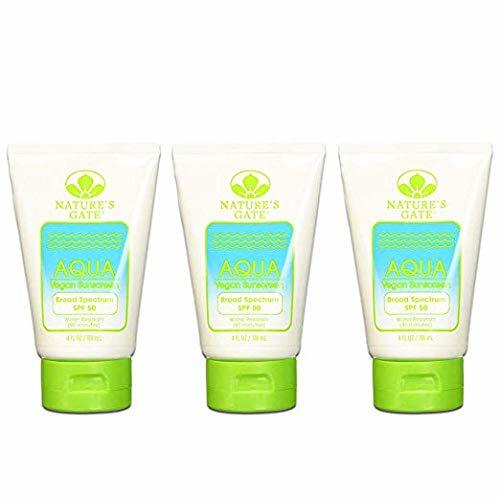 Green People Organic SPF 15 Sun Lotion with Tan Accelerator 100 mlGreen People’s sunscreen only contains SPF 15, but it’s reef safe and they’re working with the Marine Conservation Society. It uses nano titanium dioxide, which some say is bad for reefs, but the Environmental Working Group does recommend zinc oxide OR titanium dioxide as reef-friendly options. Looking for vegan face sunscreen? This sunscreen can be used as a cruelty free face sunscreen as well as body sunscreen, and is reportedly good for those with sensitive skin, so might be the best cruelty free face sunscreen if you need one for sensitive skin. Plus, if you’re looking for a vegan suntan lotion, rather unusually this sunscreen contains a compound extracted from carob that is supposed to speed up natural tanning. It might even be the best organic sunscreen UK, as most ingredients are certified organic. This is the sunscreen I ended up selecting for my trip, as I felt it offered the best balance of a reef-friendly, eco-friendly sunscreen with price. I do wish it had a higher SPF, but it does provide both UVA and UVB protection. Unfortunately their SPF 30 sunscreen is sadly not vegan, so I was forced to go with SPF 15. I’ll just have to apply more frequently and, as the advice goes, seek shade! If you’re looking for a cruelty free sunscreen UK, Green People is a UK company (though you can also order it in the US). This Alba Organics sunscreen is biodegradable and reef friendly. It’s broad spectrum sunscreen (both UVA and UVB protection) and it’s also sweat and water resistant. Unfortunately, while free of the worst reef offenders, this vegan sunblock does contain octocrylene, which the EWG identifies as an ingredient to avoid because it might be damaging reefs. 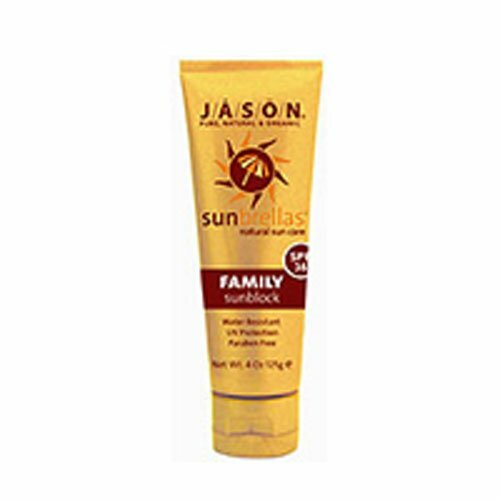 This Jason sunblock, is SPF 45 meaning it provides strong protection. This broad-spectrum sunblock provides both UVA and UVB protection and is also water-resistant (perfect for that day at the beach) and hypoallergenic. The formula’s been made for children’s skin, but can be used for the whole family, and is made for sensitive skin. The downside is that this Jason natural sunscreen does contain octocrylene, along with zinc oxide. Octocrylene, while not banned by Hawaii and considered by some to be reef safe, is listed by the Environmental Working Group as an ingredient to avoid. 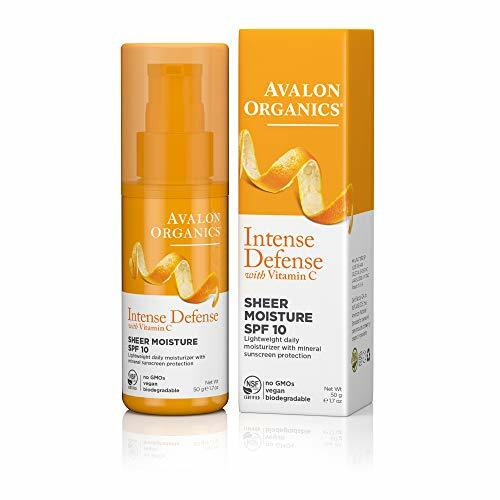 Avalon Organics sunscreen is more of a vegan face moisturiser with SPF than a sunscreen in its own right, as it only has an SPF of 10. But, if you’re looking for a vegan sunscreen at target, you’re in luck as Target stocks Avalon Organic. If you’re looking for a sunscreen not tested on animals, all Avalon products are cruelty free and vegan! Since it does only have SPF 10, it’s not suitable for a long, hot day at the beach, but would work for days where you’re likely to have less exposure or incidental exposure. It uses zinc oxide and titanium dioxide (a physical sunscreen), so it’s reef-friendly and eco friendly! This Nature’s Gate sunscreen is ideal if you’re looking for a cruelty free SPF sunblock for the beach, as this vegan sunblock is very strong (SPF 50). This natural vegan sunscreen is parabens free, fragrance free and oxybenzone free. It’s also water resistant and is gentle enough for the whole family. Unfortunately, it does contain two of the ingredients the EWG recommends avoiding to protect reefs (octinoxate and octocrylene). 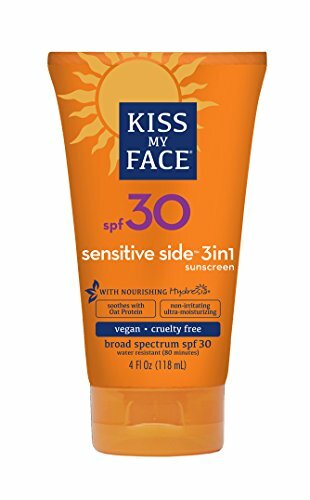 Kiss My Face vegan sunscreen is a broad spectrum suncreen that’s water resistant. It’s also paraben free and oxybenzone free. Unfortunately, it does contain octinoxate, which the EWG warns may damage reefs. This powdered sunscreen is very unique and at first glance I thought it was perfect for travelling — no need to worry about going over the airline carry-on liquid limit! Unfortunately, it contains octocrylene as a main ingredient, which the EWG warns might damage reefs. Now you know where to get cruelty-free sunscreen, pack it along with the rest of your stuff in a vegan suitcase! Click here to read my guide to the best vegan suitcases, duffel bags and backpacks for travel. Note: this post contains affiliate links, meaning if you make a purchase I’ll get a small commission, at absolutely no extra cost to you. Your support helps me keep my blog running – thank you! This is really useful stuff. Sadly, I haven’t got any sunny holidays planned, but buying the right sunscreen has been one of those things that’s always on my mind when I do. I didn’t know that octocrylene was bad for reefs, so I’ve learnt something new, but I knew not all sunscreens were great for the environment. Thanks for helping me pick more wisely next time I”m sunscreen shopping!